Definition at line 83 of file MachineLoopInfo.h. 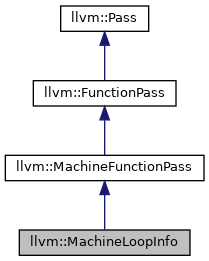 The iterator interface to the top-level loops in the current function. Definition at line 108 of file MachineLoopInfo.h. Definition at line 91 of file MachineLoopInfo.h. This adds the specified loop to the collection of top-level loops. Definition at line 159 of file MachineLoopInfo.h. References llvm::LoopInfoBase< BlockT, LoopT >::addTopLevelLoop(). Definition at line 109 of file MachineLoopInfo.h. References llvm::LoopInfoBase< BlockT, LoopT >::begin(). Change the top-level loop that contains BB to the specified loop. This should be used by transformations that restructure the loop hierarchy tree. Definition at line 148 of file MachineLoopInfo.h. References llvm::LoopInfoBase< BlockT, LoopT >::changeLoopFor(). Replace the specified loop in the top-level loops list with the indicated loop. Definition at line 154 of file MachineLoopInfo.h. References llvm::LoopInfoBase< BlockT, LoopT >::changeTopLevelLoop(). Definition at line 111 of file MachineLoopInfo.h. References llvm::LoopInfoBase< BlockT, LoopT >::empty(). Definition at line 110 of file MachineLoopInfo.h. References llvm::LoopInfoBase< BlockT, LoopT >::end(). Find the block that either is the loop preheader, or could speculatively be used as the preheader. This is e.g. useful to place loop setup code. Code that cannot be speculated should not be placed here. SpeculativePreheader is controlling whether it also tries to find the speculative preheader if the regular preheader is not present. Definition at line 107 of file MachineLoopInfo.cpp. 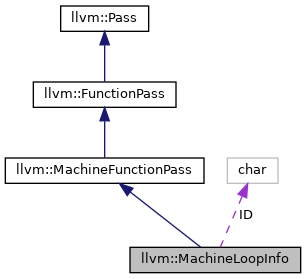 References llvm::LoopBase< BlockT, LoopT >::getHeader(), getLoopFor(), llvm::LoopBase< BlockT, LoopT >::getLoopLatch(), llvm::LoopBase< BlockT, LoopT >::getLoopPreheader(), llvm::MachineBasicBlock::hasAddressTaken(), P, llvm::MachineBasicBlock::pred_size(), llvm::MachineBasicBlock::predecessors(), and llvm::MachineBasicBlock::successors(). Referenced by llvm::createHexagonHardwareLoops(), and isImmValidForOpcode(). getAnalysisUsage - Subclasses that override getAnalysisUsage must call this. For MachineFunctionPasses, calling AU.preservesCFG() indicates that the pass does not modify the MachineBasicBlock CFG. Definition at line 44 of file MachineLoopInfo.cpp. References llvm::AnalysisUsage::addRequired(), llvm::MachineFunctionPass::getAnalysisUsage(), and llvm::AnalysisUsage::setPreservesAll(). Definition at line 97 of file MachineLoopInfo.h. Referenced by ComputeCommonTailLength(), insertInstWithExecFallthrough(), and isImmValidForOpcode(). Return the loop nesting level of the specified block. Definition at line 125 of file MachineLoopInfo.h. References llvm::LoopInfoBase< BlockT, LoopT >::getLoopDepth(). Return the innermost loop that BB lives in. If a basic block is in no loop (for example the entry node), null is returned. Definition at line 115 of file MachineLoopInfo.h. References llvm::LoopInfoBase< BlockT, LoopT >::getLoopFor(). Referenced by allPhiOperandsUndefined(), ComputeCommonTailLength(), emitBasicBlockLoopComments(), llvm::SystemZPostRASchedStrategy::enterMBB(), findLoopPreheader(), getLayoutSuccessorProbThreshold(), llvm::MachineTraceMetrics::Ensemble::getLoopFor(), insertInstWithExecFallthrough(), InstructionStoresToFI(), isIntersect(), mergeOperations(), sortBlocks(), and VisitGlobalVariableForEmission(). True if the block is a loop header node. Definition at line 130 of file MachineLoopInfo.h. References F(), and llvm::LoopInfoBase< BlockT, LoopT >::isLoopHeader(). Referenced by performSink(), and VisitGlobalVariableForEmission(). Definition at line 120 of file MachineLoopInfo.h. releaseMemory() - This member can be implemented by a pass if it wants to be able to release its memory when it is no longer needed. The default behavior of passes is to hold onto memory for the entire duration of their lifetime (which is the entire compile time). For pipelined passes, this is not a big deal because that memory gets recycled every time the pass is invoked on another program unit. For IP passes, it is more important to free memory when it is unused. Optionally implement this function to release pass memory when it is no longer used. Definition at line 137 of file MachineLoopInfo.h. References llvm::LoopInfoBase< BlockT, LoopT >::releaseMemory(). This method completely removes BB from all data structures, including all of the Loop objects it is nested in and our mapping from MachineBasicBlocks to loops. Definition at line 166 of file MachineLoopInfo.h. References llvm::LoopInfoBase< BlockT, LoopT >::removeBlock(). Referenced by llvm::BranchFolder::BranchFolder(), and getLayoutSuccessorProbThreshold(). This removes the specified top-level loop from this loop info object. The loop is not deleted, as it will presumably be inserted into another loop. Definition at line 143 of file MachineLoopInfo.h. References llvm::LoopInfoBase< BlockT, LoopT >::removeLoop(). Calculate the natural loop information. Definition at line 38 of file MachineLoopInfo.cpp. Definition at line 84 of file MachineLoopInfo.h. Definition at line 89 of file MachineLoopInfo.h.